It was truly a Wild weekend . . . . . The sky was a perfect blue, not a puff or whisp of white in sight. The shining sun rained downed to cause a flood of 30°C plus heat and high humidity. Pans flashed, pots rattled, stoves added more heat, bbq's were fired up, foods of all shapes, sizes and origins were being prepared, and people from all over the world were all heading to just one place . . . . . Yes! 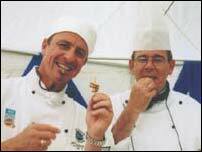 it was time yet again for the 2003 Hokitika Wildfoods Festival! If you can stab it, shoot it, hunt it, spear it dig it up . . . it will be cooked and served. Sounds all very wild I know and that is the idea of course! Sounds all very barbaric? Maybe, but I think many of us have forgotten that the Sunday roast, the meat in the Big Mac, the contents of the breakfast sausage do not all come naturally wrapped in plastic on a neat little tray . . . this is about going back to basics, back to being a hunter / gatherer. It celebrates the fact that here in New Zealand one can still live and, very well I might add, by going out if you want to and hunting or gathering your own foods. How would you like this for your evening meal tonight? This is a typical menu that could be made with foods gathered here within just an afternoon, and only cost you the price of your petrol or shoe leather. I don't know about you but for me that sure beats the hell out of frozen pizza! 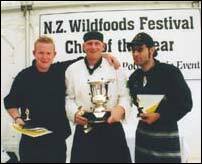 My participation in this wonderful day was to organise the 'New Zealand Wildfoods Festival Chef of the Year' competition. Nine of the country's top chefs, came from all over the country . . . flew or drove down, up and across the country to compete for the title. 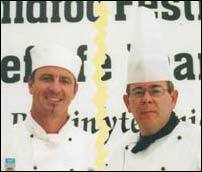 In three heats of three, they had one hour to cook four portions of a dish (based on wild-foods) of their own creation. Our guest judge was Chef Greg Heffernan. Greg managed to find time from his busy international schedule consulting for the likes of Air New Zealand, International City & Guilds, Hilton Hotels and New Zealand Beef and Lamb to come and be our judge for the day. Busy schedule indeed, after leaving us he was winging away to spend ten days onboard ship as guest chef of one of the world's biggest cruise ships. "Razzcherry and garlic pocketed alpine venison rubbed with kawakawa and watercress pesto. Perched on a moi moi rosti, wilted wild greens, needle mushrooms and highlighted with a Dunstan thyme jus. Buttered piko piko surrounds the dish and topped with beer battered elderberries"
Asked about his winning dish Chef Greg Piner said that his Head Chef had given him a lot of free kitchen time this last week to practice and perfect the dish. He also offered an explanation behind the dish. "The creation was inspired by the best wild ingredients New Zealand has to offer". The venison was sourced from the Kaikoura ranges, renowned hunting country. The pesto was made from the native herb kawakawa (Maori for 'sour'), its unique flavours combine well with the Cromwell watercress. Pocketed with roasted elephant garlic and sweet razzcherries to balance the sharpness of the pesto. The rosti was made from moi moi or pirapira which is a native purple fleshed potato and wild baby greens. Piko piko fern fronds add that freshness and his tribute to the West Coast was roadside elderberries lightly fried in a beer batter made from a locally brewed beer - Monteith's Celtic Red. There is no recipe this week due to my busy involvement with all the above, but I hope you enjoyed the column anyway. Join me next week when we start the countdown to St Patrick's Day with a true Irish recipe to get you started and in the mood for celebrating!